Valentine Carey was the illegitimate son of Henry Carey, first Baron Hunsdon. He graduated BA from Christ's College before becoming a Fellow at St John's in 1591. Following his early ecclesiastical career he became Master of Christ's in 1610, and had hopes of becoming Master of St John's in 1612, when Owen Gwyn was elected. Instead he became Vice-Chancellor of the University. He also served as royal chaplain, rector of Orsett (1611), dean of St Paul's (1614) and Bishop of Exeter (1621). He did not visit Exeter often, although on one occasion when he did he was prevented from leaving by the advent of plague in the town, for fear of spreading contagion. He did however help by ministering to the afflicted. On his death Carey gave various gifts to his family, including his young relation John Carey, Earl of Dover, who received various classical volumes. To his old College he gave Latin books on canon law to the value of £40, or around 25 volumes, all from the mid-16th to early 17th centuries. He helped encourage the building of the Old Library at St John's, being a cousin of John Williams. 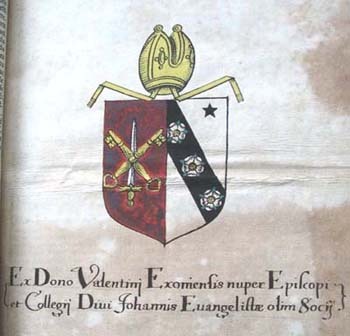 All the books which Carey gave have a hand-painted leaf inserted at the beginning, bearing his arms as Bishop of Exeter, and a Latin inscription which translates: "From the gift of Valentine, late Bishop of Exeter, and once Fellow of the College of St John the Evangelist."